If components of the reaction are colored, no visualization method is required (spots can be seen directly on the silica layer). However, most of the time it is not the case, therefore one of the methods described below should be used to reveal the spots. As a general visualization procedure, before treating the TLC plate with any destructive methods, UV-active compounds can be viewed under an ultraviolet lamp (usually for polyconjugated compounds like benzophenones and anthracenes). Furthermore, an iodine chamber can be useful for thiols, phosphines, and alkenes but it works in about 50% of cases for alkanes. It is recommended to circle the spots with a pencil on the TLC plate prior to visualization by destructive methods. For compounds that are not UV-active, there are several varieties of stains that can be used depending on the nature of the compound of interest. To use a stain, simply dip the TLC plate into the staining solution as quickly as possible, and then immediately absorb the excess stain with paper and heat carefully with a heat gun or on a hot plate at 110°C until spots are revealed. See next two pages. TLC data can be used to predict column elution based on the relationship between the retention factor and the column volume. CV is the number of column volumes required to elute the component from the column regardless of column dimensions [(bed volume) – (volume of packing)]. The greater the ΔCV, the greater will be the separation and resolution between the spots (easier separation). A bigger ΔCV will therefore allow more sample to be loaded onto the column. Described below, are the most frequently used TLC visualization methods (also called stains) in alphabetical order. Tip: Add dropwise the acid at the end and stir vigorously. N.B. : Tends to be insensitive to alkenes, alkynes and aromatic compounds unless other functional groups are present. Tip: Add the base slowly at the end until the solution turns pale blue. N.B. : Highly sensitive stain; very low concentration of product may appear as a significant impurity. 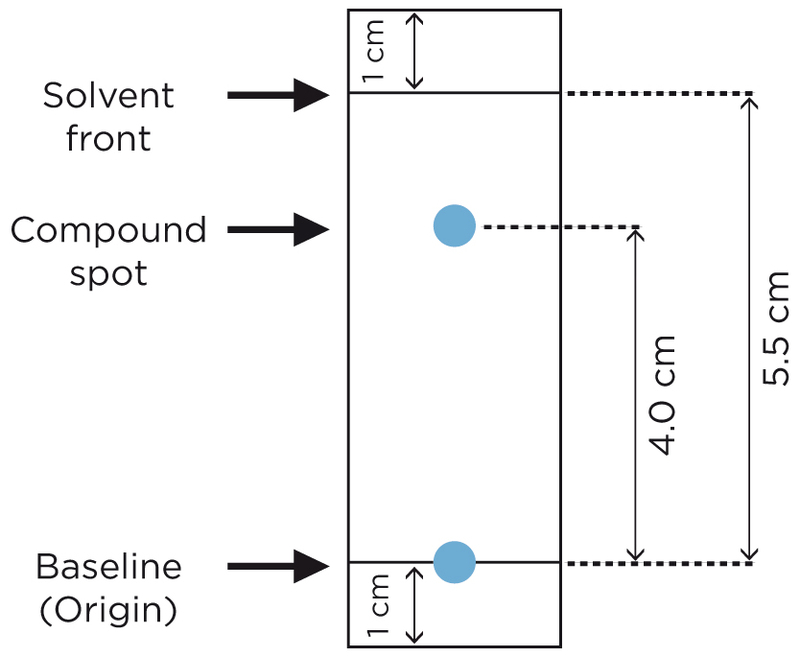 Tip: simply dip PMA treated plate in CoCl2 solution. Alkaloids, amines, organics bases, etc. Tip: mix 5 mL of each solution A and B to a solution of 20 mL of acetic acid in 70 mL of water. N.B. : iodine stain can be removed by heating. N.B. : Can be used for detection of alcohols, amines, sulfides and mercaptans groups when gently heated.